“Trump is the first president to follow through on his promise for Venezuela,” says a Florida Venezuelan-American voter. Republicans see an opportunity. DORAL, Fla. — As Richard Yepez and his daughter sat down for lunch at El Arepazo, a popular Venezuelan restaurant in this South Florida suburb dubbed “Dorazuela” for its large Venezuelan population, their thoughts turned to someone a thousand miles away: President Donald Trump. Republicans working for a second term for Trump and other GOP victories in 2020 are looking for a boost from Venezuelan-American voters like Yepez and his daughter and other Latinos who they say will reward the president for his forceful push against Maduro. The Trump administration has tightened the screws on Venezuela, slamming sanctions on individuals, oil and banks and recognizing opposition leader Juan Guaidó, who declared himself interim president in January. Trump has also pulled U.S. diplomats out of the country and even hinted at potential U.S. military action, saying "all options are on the table." In turn, the administration’s bold moves against what it calls Venezuela’s “socialist” government appear to be energizing Venezuelan-Americans and other Latino voters in this swing state, where races are won by thin margins. 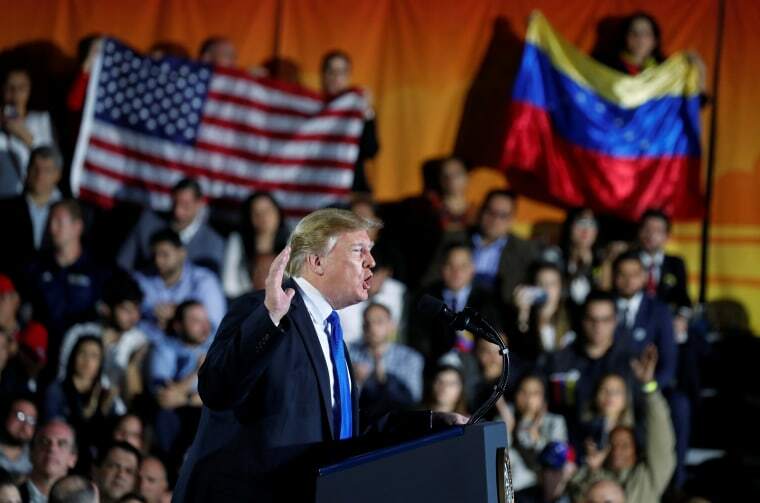 Rick Wilson, a Florida-based Republican strategist critical of Trump, said that while opposing the Venezuelan government was good politics in his state, any net benefit for Trump would probably be marginal. “I think it’s probably offset by the fact that Puerto Ricans in Florida — who comprise a vastly larger percentage than the Venezuelans — hate Donald Trump with the fire of a million suns,” Wilson said. Although Trump lost the Latino vote badly in 2016 — winning only 28 percent nationally and 35 percent in Florida according to exit polls — he doesn’t need to win a majority to have an impact. In a battleground state that Trump carried in 2016 by only 112,911 votes, even small fluctuations can be important. In Florida, roughly 17 percent of registered voters are Hispanic, more than 2 million in all. Eduardo Gamarra, a political science professor at Florida International University, said a country-specific strategy makes sense in the Sunshine State. “A lot of what happens when Latin Americans — especially recent immigrants — enter in American politics is they see things through the prism of their own countries,” he said. For years, Venezuelans have been fleeing to South Florida. Over 221,800 live in the state, the largest population from the South American country in the U.S. Not all can vote, but many do, and there are enough voters to affect the elections. Sen. Marco Rubio, R-Fla., who was first elected while Barack Obama was president, saw an opening under a Republican administration and has become the chief architect of U.S. policy toward Venezuela. Rubio’s influence became clear after Trump’s inauguration, when he arranged a meeting in the White House with the president, Vice President Mike Pence, and Lilian Tintori, a democracy activist and the wife of imprisoned Venezuelan leader Leopoldo López. “That was probably a turning point,” Gamarra said. Rubio has become one of the biggest proponents for Venezuelan exiles, visiting the Colombia-Venezuela border last month, and tweeting multiple times a day about events in Venezuela — often as they unfold. Venezuelans usually reply with an outpouring of gratitude. “But more broadly throughout the state, the anti-immigrant rhetoric that the president has become known for is going to mitigate any gains in South Florida as a result of the Venezuela policy,” Curbelo said. Latino voters in Florida, like elsewhere, are not a monolith, however. The Puerto Rican population is focused on different issues than the Mexican community based in central Florida, or those from Cuba, and Venezuela that are more populous in South Florida. Even within these groups, there are partisan differences among the varied generations and socio-economic groups. Moreover, Trump's recent actions have further cemented the perception that he’s hostile to Latinos and immigration from Latin America. On Friday, Trump’s re-election campaign released a video emphasizing his push to build a border wall to address “the crisis at the border,” a move that polling shows is deeply unpopular with Latinos. For Republicans, the president’s stance on Venezuela is also chance to reinforce their argument that Democrats are veering into socialist policies, embodied by the legislation and rhetoric coming from Rep. Alexandria Ocasio-Cortez, Sen. Bernie Sanders, Sen. Elizabeth Warren and others. As Trump tries to cast his potential Democratic opponents as “socialists,” Republicans hope voters will draw a parallel with oppressive leftist governments in Latin America. Democrats acknowledge they could lose some ground to Trump, particularly among Venezuelan-Americans and other Latino voters. “This is going to be a big problem for Democrats in Florida in 2020,” said Gustavo Arnavat, a member of the Obama administration who was active in 2008 and 2016 Democratic campaign finance efforts and Florida Latino outreach. Is Dems' tough stance on Venezuela enough? Top Democrats like former Vice President Joe Biden and House Speaker Nancy Pelosi support Guaidó and have said Maduro must go. But Democrats hoping to show they’re playing an active role on Venezuela are at an inherent disadvantage, because the White House, not Congress or future presidential candidates, control America’s foreign policy. Still, Democratic Reps. Debbie Wasserman Schultz and Donna Shalala of South Florida, whose districts have large numbers of Venezuelans, were at the Colombia-Venezuela border recently, condemning Maduro. Along with Debbie Mucarsel-Powell, D-Fla., they introduced three bills that passed in the House, expanding U.S. aid, examining the role of Russia in Venezuela's affairs, and prohibiting the export of crime-control materials to Maduro's government. Another bipartisan bill was introduced by Sen. Robert Menendez, D-N.J., and Rubio to authorize $400 million in humanitarian aid for Venezuelans. A group of 23 Democrats and one Republican senator — Rubio — have urged Trump to offer temporary protected status (TPS) to Venezuelans, a step Trump has not taken to date, said Enrique Gutierrez, the Democratic National Committee’s director of Hispanic media. The status is generally given to people whose countries have been ravaged by natural disasters or war and allows them to remain legally in the U.S. until the situation improves. Democrats like Ulvert say Venezuelans in the U.S. are realizing “there is a lot of empty rhetoric coming from the Trump administration because asylums are taking longer and TPS has not been authorized.” In fact, the Trump administration has taken steps to end protected status for half a dozen countries. But a few voices of opposition from the Democratic party may have alienated some Venezuelan and Latino voters. Sixteen Democrats in the House sent a letter to Secretary of State Mike Pompeo expressing concern over Venezuela policy, including the recognition of Guaidó as interim leader. Those who signed include Ocasio-Cortez, D-N.Y., and Ilhan Omar, D-Minn., who had already voiced opposition to Washington’s handling of Venezuela. Others are wary of Sanders, I-Vt., who is vying for the 2020 Democratic party nomination, for refusing to call Maduro a dictator and declining to endorse Guaidó. "Some Venezuelans are not seeing the nuances of the Democratic party," said Gamarra. "They don’t really understand the Democratic party as a huge umbrella." None of the 2020 Democratic primary candidates are supporting Maduro, although some have declined to label him a “dictator” or have suggested American intervention would be irresponsible given the checkered U.S. history in Latin America. After Trump flew to Miami in February to lambast Maduro and vow support for Guaidó, the Make America Great Again Committee — a joint fundraising committee of the Republican National Committee and the Trump re-election campaign — started running online ads playing off of the speech at Florida International University. The ads have run in English and Spanish in Florida, North Carolina and Virginia, among other places. Carmen Sesin reported from Doral, and Josh Lederman from Washington.